A LaFerrari Aperta and other supercars will join top Rolls Royce and classic cars at the Bonhams Goodwood Revival 2018 sale. Several modern hypercars, including a 2017 Ferrari LaFerrari Aperta and a 2015 Ferrari LaFerrari Coupé, are among the highlights of the Bonhams Goodwood Revival sale in September 2018. It is only the second LaFerrari Aperta ever offered for sale at a public auction. Other highlights of the sale include classic coach-built Rolls Royce cars from Bentley’s heritage fleet and the UK registration plate ‘RR1’. Bonhams annual Goodwood Revival Sale takes place on 8 September 2018. This is one of three classic car auctions that Bonhams arranges most years at the Goodwood estate in southern England. It is usually a smaller event than the well-known Goodwood Festival of Speed sale. The Bonhams Goodwood Revival auction is usually famous for its preservation ready and often cheaper classic cars but in 2018 several top modern hypercars will also be on offer. The auction is led by two LaFerraris: the 2017 Ferrari LaFerrari Aperta is estimated at £5,000,000-6,500,000 (US$6,400,000-8,400,000) and the 2015 Ferrari LaFerrari Coupé at £2,300,000-2,800,000 (US$3,000,000-3,600,000). This is only the second time in history that a LaFerrari Aperta has been offered at public auction. Widely recognized as one of the most important supercars created in the past decade, the LaFerrari represents the pinnacle of Ferrari’s longstanding supercar heritage. Drawing on F1-derived engineering and design, the LaFerrari caused a frenzy when it was first released and became an instant classic. The striking futuristic design is complimented by its hulking V12 hybrid engine that produces an astonishing 963 bhp at 9,250 rpm and is capable of more than 200 mph. 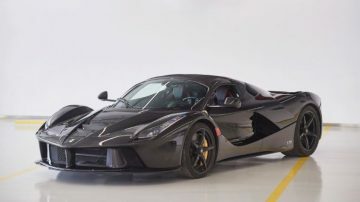 The 2015 Ferrari LaFerrari Coupé example is finished in Grigio Rventon Lucido, a stunning metallic gunmetal gray with an elegantly accenting Piano black center section and black and red interior- it has covered 5,900 km, which is fairly high compared to some of the delivery mileage examples that were offered at recent auctions. The 2017 Ferrari LaFerrari Aperta is the ultimate evolution of the groundbreaking model, and only 210 were ever created. Finished in Nero Daytona with red and black interior, this is a true Ferrari masterpiece and a very low mileage example with a mere 510 km on the odometer. This is only the second occasion on which a LaFerrari Aperta has been offered at public auction, making this an unmissable opportunity for a serious ferrarista to add one of the most collectable cars ever created to their stable. The last of 210 Apertas produced achieved $10,043,000 for charity at the RM Sotheby’s Ferrari Maranello 2017 sale. Rolls Royce heritage fleet is a significant collection of coachbuilt motor cars that was manufactured at Crewe under the combined company of Rolls-Royce and Bentley. These cars have been held under the custodianship of Bentley motor cars since the company was divided in 2000. Bonhams has consigned this marvelous collection of eight historically important motor cars and one highly sought-after registration plate for its Goodwood Revival Sale on 8 September. 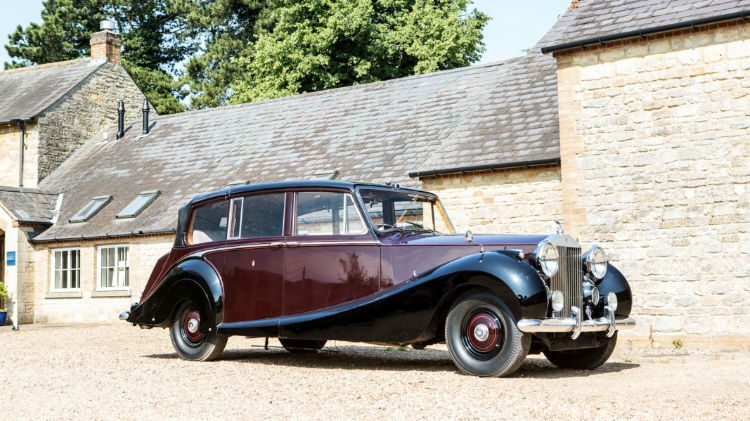 The star of the collection is the 1950 Rolls-Royce Phantom IV State Landaulette with coachwork by Hooper & Co, which is estimated at £1,000,000-2,000,000. This is identical to the model in which Meghan, Duchess of Sussex, was driven to Windsor Castle on her wedding day to Prince Harry, highlighting the significant role that Rolls-Royces have always played to the British royal family. The 1960 Rolls-Royce Phantom V ‘High Roof’ State Limousine is another imperious motor car offered in the collection, a model favoured by royalty, captains of industry and heads of state on their most important engagements. It is estimated at £1,000,000-1,500,000. A further highlight of the collection is the cherished UK registration plate RR1, surely the holy grail for any true Rolls-Royce enthusiast. It has a presale estimate of £500,000 to £600,000 (US$640,000-770,000). In contrast RRM1 may go for a snip at £100,000-150,000.